No telling if they gave him a pocket watch at his retirement ceremony, but perhaps a stopwatch might have been more appropriate. In March, Montebello resident Jody Hoshino called it a career after 20 years as a compliance analyst, but he’s been anything but sedentary. 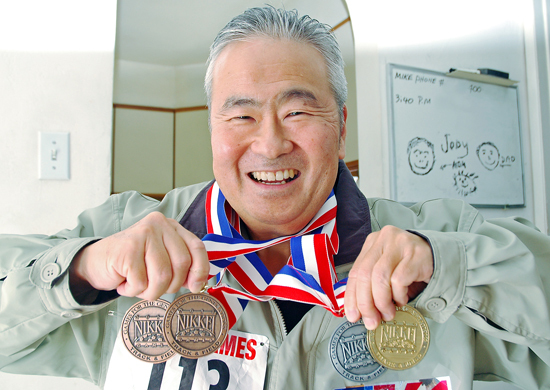 Hoshino, 55, has taken up running with a passion, logging up to four miles every day, and his training paid off with four medals at the 2014 Nikkei Games. He did more than try. Hoshino has entered and finished the L.A. Marathon five times. Last year was his first entry into the Nikkei Games track and field meet. This year, Hoshino took the gold medal in the 1600 meters, silver in the 100 meters, and a bronze in both the 50 and 400 meter dashes.